The small chocolate conche/milling machine is one of the major equipments which is used for the fine grinding of chocolates, and it is also suitable for the fine grinding of soybean flour, as well as the daily used industrial chemicals for high-standard granularity. The fine grinding time is about 8~16 hours depend on different model, the average granularity can achieve 20-25 micron. This machine has many merits such as tight structure, easy operation, convenient maintenance, little one-off investment, and so on. 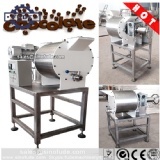 It is the key equipment for the fine grinding of chocolate paste materials in the chocolate production line. And it is suitable especially for the technical request of chocolate and candy factory.